It’s an annual tradition in CoMo. Caught in the grip of spring-cleaning fever, Columbians follow the age-old ritual of opening their closets and sifting through the remains of failed fads, fashion faux pas and fat clothes. They haul away the good stuff — the wearable items — to a favorite charity and go home feeling pretty good about themselves. But what about that pile of rejects, bagged up and ready for a trip to the landfill come next trash day? There’s a better way to dispose of Junior’s lucky socks that he wore to every basketball game until they unraveled, or that T-shirt the cat shredded on her last trip to the vet, or even the tablecloth that hasn’t been used since The Barbecue Incident. Recycling those unwanted, unwearable textiles for repurposing as padding, insulation or other value-added uses is a winning argument for minimalism: less clutter, less trash, less waste — and it comes with the feel-good bonus that you’re helping to save the planet. Forty-three years after Sen. Gaylord Nelson developed the idea of Earth Day, the nationwide grassroots movement to conserve the world’s resources is a mainstream effort. Even in cities such as Columbia, there is curbside or drop-off recycling for everything from cardboard to household hazardous waste. But we could do more. Many people don’t think about recycling certain items such as clothing. Sure, they’ll donate wearable clothes to Goodwill, but stained T-shirts, old underwear and ripped jeans, for example, end up in the trash. Folks throw these items away because they think: Who’d want to wear my stretched-out athletic socks or my faded high school sweatshirt? The answer, of course, is nobody. But what can’t be worn can be recycled, a concept no one understands better than Jana Hawley, head of the Textile and Apparel Management Department at the University of Missouri. The challenge is teaching consumers what to do with their unwanted clothes. “The goal is to have zero waste,” says Hawley, whose research focuses on post-consumer waste — items that have been purchased, worn, and then discarded because they’re worn out, damaged, the wrong size or no longer in style. These items could all (yes, even that old underwear!) 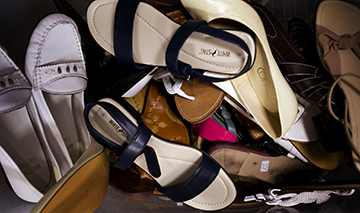 go to an organization such as Goodwill where the store will decide which items are salable. Here’s how it works at the new Goodwill facility at 507 E. Nifong Blvd. Customers drive through the easy-to-access donation area. Their unwanted items are sorted into sellable and unsellable piles. The sellable items are displayed in the store for two weeks, at which point they’re discounted 50 percent. If the reduced-priced clothing doesn’t sell during the third week, it joins the unsellable pile. The unsold pile is then loaded on a truck and taken to the St. Louis-based Goodwill Outlet Center — a “pound store,” says Mark Kahrs, senior vice president of retail operations at Goodwill. Items are displayed on a rolling table and sold for 79 cents a pound. Items that don’t find a home at the pound store are amassed into 1,300-pound bales. Recycling centers then purchase the bales, and truck them away — 32 bales to a trailer. Once at the recycling center, items are sorted further; sometimes, items are set aside for disaster relief or developing countries. “Appropriate clothing is shipped to Africa, and her people are clothed at a cost that is fair,” says Hawley, adding that Africa is not simply a dumping ground for Americans’ unwanted items — a lot of thought goes into what items are sent there. “Most Africans disdain skimpy tops and miniskirts … shirts sell not because of their designer label, but rather because of their bright colors.” The United States annually exports nearly $62 million in sales to Africa. Hawley says she hopes Columbia will have its own textile-recycling center someday. “Many municipalities do not offer any — let alone convenient — textile recycling, and this is their loss,” she says. “It often proves lucrative and can subsidize the rest of a recycling program … the typical solution to this problem requires setting up big waterproof boxes that donors can drop their items into.” Hawley points out that most of the 500-or-so U.S. recycling companies employ fewer than 50 workers; these small businesses contribute to the local tax base and generate more than $700 million in annual gross revenue. In 2009, Hawley spearheaded a movement to bring textile recycling to Boonville. With the help of 12 fashion-merchandising students, she set up Savvy Seconds, a resale store, in conjunction with Unlimited Opportunities, a social service center that offers job training for physically and mentally disabled adults. Hawley’s students trained these workers to sort clothing and shoes. The clothes were sold, either in Savvy Seconds or in bales to for-profit recyclers. “Today, Savvy Seconds has grown to a recycling house that not only sells used clothing, but that also recycles aluminum, plastics and cardboard — a much-needed resource for the rural community,” Hawley says, noting that a fire destroyed the organization’s building on Feb. 2. Despite the setback, Unlimited Opportunities continues to serve customers and recycle. “It’s an economic, environmental and human success story,” Hawley says. Always check with your charity of choice before donating damaged or stained items. If it’s not set up to take unusable articles, staff may direct you to one that can. Unlimited Opportunities, which was destroyed by a fire on Feb. 2, continues to operate out of a temporary warehouse at 1920 Main St. in Boonville, and picks up donations in and around Columbia. The organization intends to rebuild on its original site but needs extra funds. Visit www.uoi.org to find out how to help.